I was washing dishes last night and happened to read the lid of this cookie dough container. 21 DAYS? What is IN this stuff that makes cookie dough shelf stable for 3 WEEKS????? YUCK!! 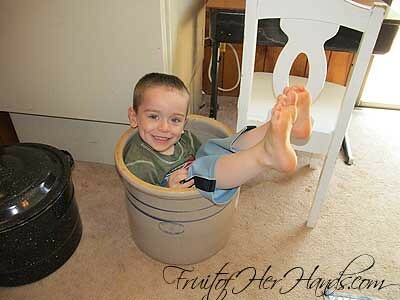 Now as for how the container got in my house. . .my inlaws use a variety of containers to store their homemade ice cream when they make it. It just happened to hold the homemade ice cream that I brought home with me last week when we were there. The ingredient list is really long and honestly I didn’t take the time to read it. 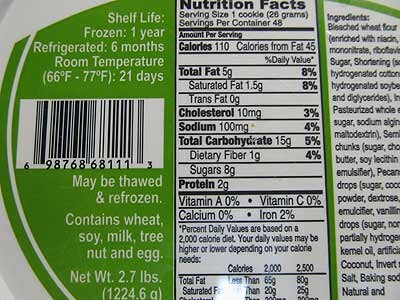 Just the shelf life label grossed me out! By MelodyIn Kitchen4 Comments on YUCK! 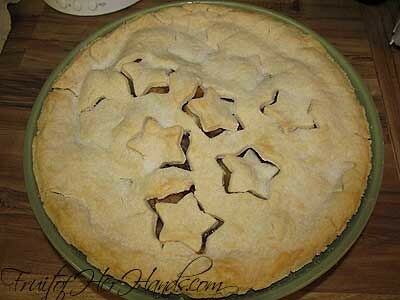 On Monday, I made an apple pie. It looked all right and tasted pretty good. The crust was a complete flop though. 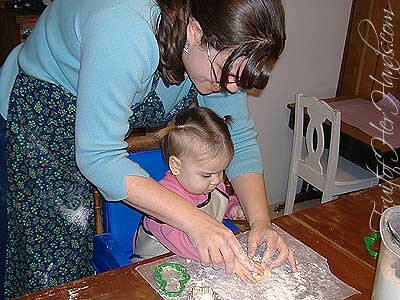 I tried a new recipe from Allrecipes.com – just searched for pie crust and selected one based on high ratings. Then I substituted coconut oil for the shortening. What a total failure. It was actually kind of puzzling. I’ve been using coconut oil instead of shortening for a long time now, and have never had any bad results in any other recipe. But this time was different. The crust wouldn’t hold together for anything! All I can think of was that I didn’t let it chill in the fridge long enough (the recipe didn’t call to chill the dough at all). The bottom crust I started working immediately, and put the rest of the dough in the fridge to chill until I was ready for it. It just kept breaking and falling apart. I called my mother-in-law for help and she probably thinks I’m completely inept in the kitchen from our “my pie crust looks awful!” conversation. It was easier to work with the top crust, so chilling it did seem to help some. It was the flakiest pie crust I have EVER eaten. It also would have been better with a touch more salt in it as it tasted a little bit bland. But other than that. . .I think I just might try the recipe again. . .maybe. . . There is a reason I don’t make pies that often. Pie crusts and I just do not get along! Here are some of the ideas I’m considering to put up for when baby comes. A lot of it will be determined by space in the freezer as we just downsized to a much smaller one. I’m also thinking to just make double at mealtimes and freeze the extra, rather than having a couple huge cooking days. Also plan out meals for months of October, November, and first part of December ahead of time. I’m working on complete menus for July and August right now. We have a huge upright freezer but will be downsizing to a somewhat smaller one because this one doesn’t work that well. Instead of stocking up on huge 9×13 casserole size dishes, I’d like to put some components up – like cooked taco meat, cooked and seasoned ground beef, etc. because they’ll take up a little less room than a bigger dish would. In the past, I’ve done pizzas (make crust ahead of time, assemble, then freeze), chicken and broccoli casserole, lasagna, shepherd’s pie, and I forget what else. What are your favorite freezer meals? Got any good sites to link to? The boys got a bit sugar sprinkle happy. I didn’t mind until I looked at Caleb and saw that he had the entire bottle of blue sugar in his mouth. Good thing I noticed it after we finished and not while we were still decorating the cookies! 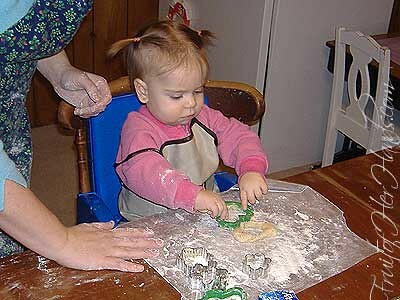 Even Anna had fun pushing the cutters into the dough. 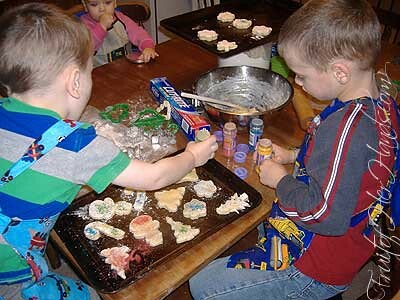 We won’t be giving any of these cookies away as gifts – there was too much finger licking and dough snatching and thumb sucking going on – but we really enjoy them. I like that particular cookie recipe because it uses basic ingredients, isn’t too sweet, and you can use cookie cutters with it. Ok, that, and I have yet to find a regular sugar cookie recipe I really like, but that’s beside the point. We had a lot of fun last night and made a huge mess. 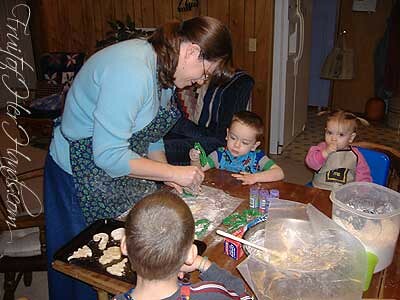 But the best part was that Stephen washed the dishes afterward so I could work on the boys’ quilts. What a wonderful husband I have! I wasted an entire batch of sweet icicle pickles yesterday morning. I’m still a bit frustrated about it. The pickles were on the second to last day of the brining process, until I flung glass into the container. The last four days you’re supposed to drain and reheat the syrup that spices the pickles. I’ve been using a plate on top of the container to keep the pickles submerged, with a glass canning jar full of water on top. I took the glass jar out and went to set it on the counter, but it slipped out of my hand into the giant metal pot in the sink. Water and glass shards flew everywhere. Many of the pieces were so small I didn’t see them, but could feel them when wiping up the water. It also gouged the bottom of my good stockpot. 🙁 We weren’t sure if any glass got into the pickle container but we know some of the water did. . .so we’re assuming the glass did too. The cost of ingredients isn’t worth keeping the pickles for the chance of eating glass, but I sure am disappointed we have to dump the pickles. 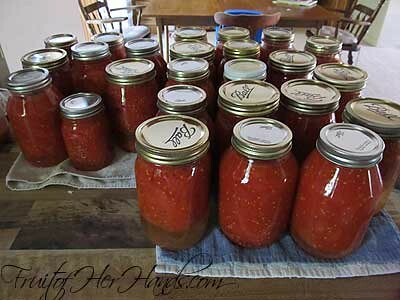 Today I was able to can 7 quarts and 4 pints of tomatoes. It probably doesn’t sound like a lot, but it’s more than I thought it would be. It was quite the surprise to discover that there was enough for a double batch instead of the single I anticipated. This particular recipe is from the Ball Complete Book of Home Preserving book I mentioned in a previous post. It’s tomatoes with mixed vegetables. We really like the combination of veggies in it (tomatoes, celery, onion, and green pepper), and it was nice to be able to can more this year. Our tomatoes haven’t been going crazy yet like they have in the past, but they’re still doing well. In the past, we’ve always grown a hybrid variety like Better Boy. This year we grew almost all heirloom varieties. The one we grew the most of was called Rutgers – I wanted Brandywine tomatoes but we couldn’t find them. We also grew Yellow Pear (they look really strange – I’ll have to pick some and take a picture) and Mr. Stripey. The Yellow Pear have good flavor but are more of a salad tomato since they’re so small. The Mr. Stripey tomatoes are some of the biggest I’ve ever seen, but we haven’t gotten many off that plant at all. My favorite this year though was the Sweet 100 – it’s not heirloom but those tomatoes are so sweet. They’re marble-sized and I eat them right off the vine when I’m in the garden. They taste amazing. Those are definitely on my list to grow again next year. Usually we just buy half a flat or so of the same variety, but this year we changed things around quite a bit. We followed the garden in a day plan so Samuel could have his own garden, and let him pick what tomatoes he wanted (he picked Better Boy and Sweet 100). For mine I picked Yellow Pear and Better Boy because Samuel wanted another one. That raised bed garden (we doubled the garden’s size and then split it) did really well and was fun to plant. 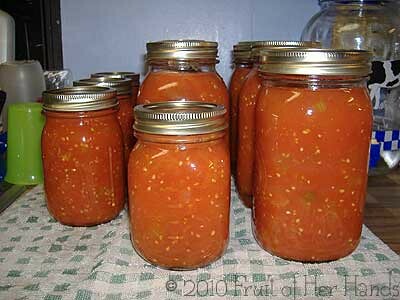 The majority of our canning tomatoes are in the main garden with everything else. We changed that around too – we’ve been reading and experimenting with intensive gardening and raised beds. We are absolutely thrilled with the results. Our garden isn’t much to look at this year, but we’re getting more produce out of the same amount of space as before. What a blessing! The neighbors let us pick apples from their trees on Wednesday. 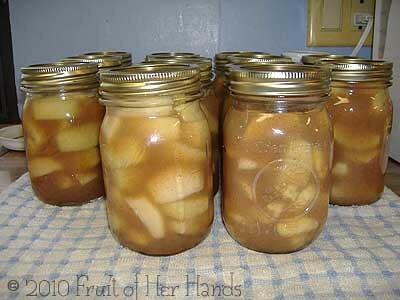 So far, I’ve canned 14 pints of apple pie filling (recipe from my Ball canning cookbook), and there’s still plenty of apples left. I’m thinking of doing applesauce next. Next week I hope to get some tomatoes canned, but our plants aren’t doing as well this year as they usually do. We’re getting a decent amount of tomatoes, but not enough at one time to can. Hopefully soon. By the way, if you’re new to canning, I highly recommend the Ball Complete Book of Home Preserving. 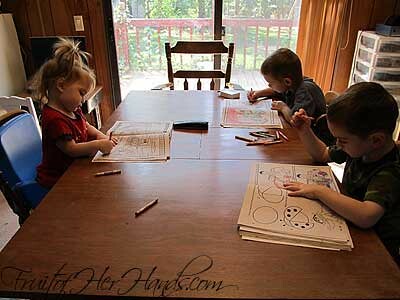 The instructions are very thorough, and everything we’ve tried out of it has tasted fantastic. We have really been enjoying scones lately. We eat them just about every week. 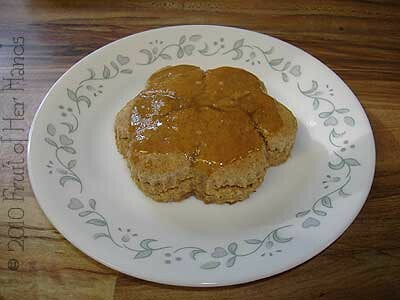 This morning it was pumpkin spice scones. I do make a few changes to the recipe (2 cups wheat flour and no raisins), but we absolutely love them.